Essential oils provide my family and I with many benefits. From easing headaches to making the house smell amazing, those little bottles of joy have made my life a lot easier. However, keeping them organized and secure, especially while traveling hasn’t always been easy. An essential oil organizer might be a good option for those of you who like to take your oils on the road. If you travel a lot or have a business in essential oils, you may want to consider these following things. When shopping for a essential oil organizer for your precious little bottles, it is important to take note of a few things. How many bottles does it need to hold? What styles and colors do you prefer? Do you need a well-cushioned case for traveling or do you need a box style for at home organization? With all the options available for purchase, it is important to consider these things before investing in an essential oil organizer. If you are an essential oil newbie, you may want to start off with a smaller case that holds ten to fifteen bottles. There are many affordable options for cases that hold a smaller amount, which can also be great for oils on-the-go. You may opt for a smaller case if you only have a small collection of essential oils. If you want to include room to grow your collection, perhaps look for a case with twice as many spaces than you currently need. This will ensure that you have room for growth, but aren’t hauling around an empty case for too long. Larger essential oil organizers can be great for at home storage of your entire collection. While larger cases may not be viable for travel due to restrictions when flying, essential oil fanatics may find themselves needing hefty organizers. Large, travel size cases are available, but will most likely have to count as a checked bag if you are flying. Some cases out there can hold over 100 bottles! The important thing to keep in mind with larger cases is that the heavier the case, the more likely it is to break if dropped. Hard-shell style cases may reduce the chance of broken bottles and lost product. essential oil organizers come in a variety of materials such as cloth, plastic, and wood. You may want to consider the material based on how well it resists stains, if it is washable, and how well it will travel. For example, wood cases often have metal latches and hinges, meaning they might cause a problem in airport security. Cloth cases with a dark interior will show fewer stains that a light color or wood material. Wood is more sturdy, and has a more polished, professional look if you are working with clients. Some of the wood cases have multiple tiers with pull out drawers that double as a display case. Be sure to choose a case that will not only provide breakage protection for your bottles, but keep in mind that glass rubbing on glass can leave your bottles looking a little shabby. If the bottles are clanking into each other, they may break. Many essential oil organizers are lined with foam padding for added security. As mentioned before, a wood case with tiered pull-out drawers can be a great way to display your oils concisely. If you want to use a cloth case, however, you may want to consider the readability of your labels once everything is packed away in the case. If your essential oils are part of your business, being able to quickly locate the oil you need is important. If you go the route of the cloth case, you may want to consider how well the case displays the labels. If you are in the essential oil business, you probably already know how product presentation can impact sales. Stitched handles may put your oils at risk if they are not of quality. Hardware latches and hinges can also give if the box becomes too heavy. You may want to consider the quality of the handles, especially if you need something extra portable. Some essential oil organizers have no handle at all, which puts your oils at less of a risk of being broken because of a snapped handle or broken latch. Essential oils can be costly, so choosing an all-around quality case is vital to securing your inventory. The most obvious feature of this option is its beautiful and professional appearance. From the beautiful engraving to the exquisite hardwood, this is an aromatherapist’s dream. If looks and display are what you are after, this may be the right choice for you. However, this might not be a viable option for travel, as it may get scratched or broken. It also does not hold a large variety of bottle sizes. Another slight irritation is that the drawers are not on rollers, which causes some trouble when sliding out the drawers. 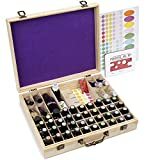 If you don’t mind that it only holds small sizes, this organizer may be a good choice for you if you wish to display the types of oils you use or sell. 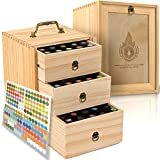 The Earth’s Gift Essential Oils Box comes with labels so that you can clearly mark your oils. If this box gets dropped when full of bottles, the weight may cause damage to the case or your collection. 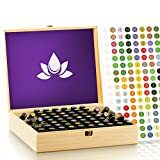 The Earth’s Gift Essential Oils BoxThis simple wooden case holds up to 72 bottles and features eight slanted slots for roll-ons. The slots are large enough to hold a variety of bottle sizes from all your favorite brands of oils. This set can also be a great gift; it comes with an essential oil key and customizable, color-coded labels. The removable foam pad also adds an extra pop of color. The vintage-style hardware makes this not only a storage case but a decorative piece for your home or shop. The dividers are removable for added flexibility. The smooth box has a plain design with no logo, and the lid opens and closes with ease. While it has a sturdy handle, this organizer might be damaged if dropped. This high-quality wood case holds 35 one ounce bottles. The box is constructed of sturdy pine wood, and makes an attractive display, but is compact enough to store your oils out of sight. The dividers ensure a snug fit for your oils so that they do not slide around and get broken. This essential oil organizer also comes with labels for easy identification of your oils. This may be a good option for traveling with oils because of the sturdy construction, however it does not have a handle. This may be a good option for you if you want a professional display case and are only transporting them by car. This compact case holds 70 vials, with little room for them to clank into each other. This is a hardcover, material case, that may be a good option for you if you don’t need an extravagant display. This case holds 5 mL, 10 mL, and 15 mL bottles. This essential oil organizer features a soft foam hand strap, a sturdy double zipper, and even an inner storage pouch for pipettes, extra labels, business cards, and anything else you want to keep safe. 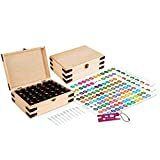 This organizer also comes with 96 pre-printed labels, 96 blank labels, and an essential oils key which is made of long-lasting metal. 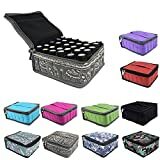 This soft-shell case comes in ten different colors and patterns and may be a good choice for someone who is just starting out in the essential oil world. It has enough space to grow your collection without leaving to many open spaces. While it is portable, the soft shell may not provide as much protection while traveling, though it may be easier to clean than a wooden case. This organizer does not offer much in the way of doubling as a display case, but is a cheap and cute starter case. This case does not include labels or an essential oil key. The cushioned handle of the case sits on top to allow for even weight distribution. This may be a good option if you only have a few oils and want to keep your growing collection safe. Each of these cases can provide you with the protection you need. However, I have found that the Tress Wellness case offers adequate storage, quality protection, and travels just fine. The wooden cases are beautiful but can be very heavy when full. While the Tress Wellness case doesn’t provide the same display setup as its wood counterparts, it still has a sleek and professional design that may work for an essential oil business. If the case is dropped, the shockproof hard shell will keep oils safe. A wooden case might bust if it hit the floor with the weight of all the bottles. I have found the case by Tress Wellness to be the best of all worlds, but the important thing is to pick a case based on your individual needs.